Having built five silver prop planes in a row, and with a natural metal T-6G already on the workbench, I needed a break from propellors and silver. 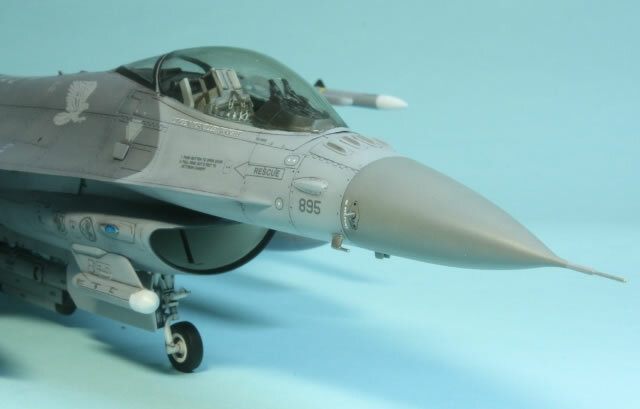 This Tamiya F-16 proved just the tonic. 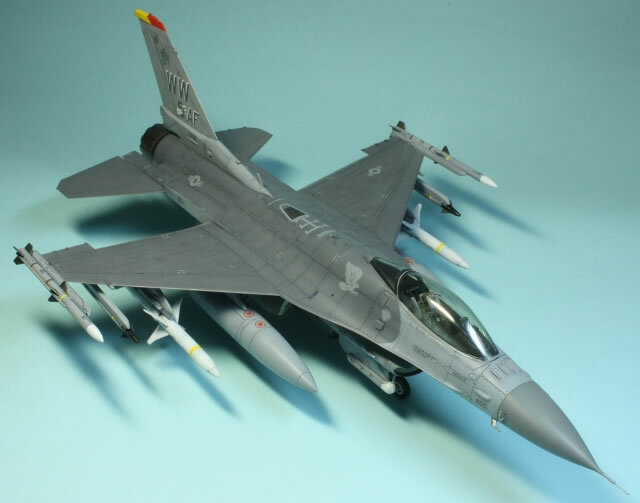 I had high hopes for this kit, since it is a fairly recent Tamiya release and I was very impressed with their P-47D. Some magazine reviews I read had flagged up a few problems, and regrettably I found similar problems during my build. However, they cannot eclipse the fact that this is a superb kit and a joy to build. The cockpit saw one of only two additions to the kit, in the form of some seatbelts made from masking tape and Reheat photo-etched buckles. 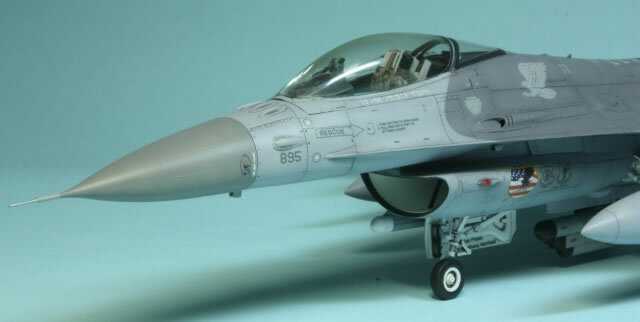 The cockpit is well appointed and more than adequately detailed for a closed canopy; Tamiya even supply some stencilling for the seat, which I wish more manufacturers would do. With the cockpit underway, I also began constructing and painting the most complex area of the model: the undercarriage and intake assemblies. For an injection moulded kit, the undercarriage is a work of art, with decals and plenty of detailed parts. Unfortunately it is marred (as are many other parts of the kit) by numerous ejection pin marks. Many are nigh on impossible to remove; I really think it would be a great challenge to turn this model into a contest winner if any of the judges are familiar with the kit because these marks are so numerous and located in such difficult to access places. 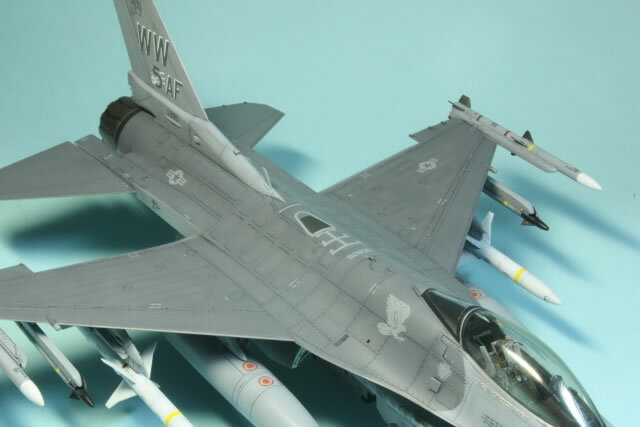 I left the bulk of them on my kit untouched, although I filled them where I could and where they were most visible, like on the nose wheel tyre. 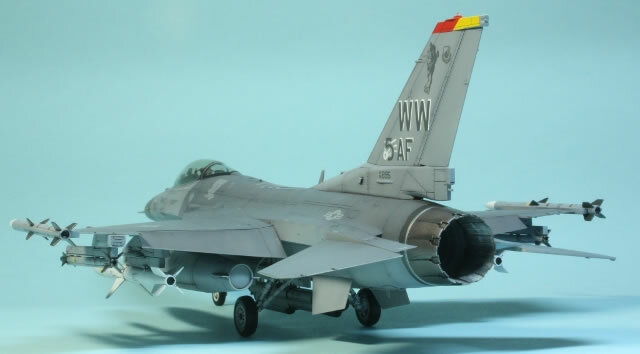 Others became evident during painting, too late to rectify, notably on the tip of the tail and on the underfuselage nose pitot. Without a doubt, this is the area where Tamiya could improve the most, and I continue to be surprised that this issue has not yet been resolved given the superb engineering of the rest of the kit. Back to that intake/undercarriage assembly. My plan of attack deviated from the instructions. There are two basic problems: 1) The intake trunking is full-length and in four parts, making seam removal difficult, and 2) the main undercarriage legs must be inserted before the lower fuselage panels can be completed, which is a pain for painting and clean up. I therefore first assembled and painted the rear half of the intake trunking and the front half separately. Using some dried up Gunze Mr Basic White 1000 (which makes a wonderfully fine grained white filler that can be cleaned up with Gunze thinner) I filled the seams and spent a long, long time sanding the long seams. For this I used disposable wooden chopsticks with rolls of sand paper attached using blu-tac. When that was finally done, I sealed up one end of each half using masking tape and poured Mr Basic White 1000 paint into each. I then immediately poured all the paint out, removed the masking tape and let the paint dry. Doing this three times left a well-coated, white intake, although next time I shall take more care as I got a very slight run right at the rear end of the rear intake. With the two halves painted, I brought them together. This left an ugly vertical seam which I was not prepared to spend ages cleaning up. If I were to build this kit again, I'm not sure what I would do differently to avoid this problem. I might consider joining both upper halves togther, then the lower halves, and finally joining the two long lengths, but this would make the seam in the centre of what is a very long intake trunking extremely difficult to clean up. As it is, on my model you need to use a torch to detect the problem as the visible seam is quite far back along the intake interior, so I was satisfied with the result. At this stage I had a very long intake trunk, with attached undercarriage bay, that needed to be installed into the lower fuselage. But first the outer intake, underneath the front fuselage needed to be added. This area of the kit I found to be the most disappointing in terms of fit. The main outer intake is made of four parts, none of which fit particularly well, with joins crossing prominent raised detail near the navigation lights which is difficult to preserve. The intake lip, which I pre-painted black to avoid some tricky masking later on, was a poor fit and took a lot of sanding to blend in. A fair amount of the recessed detail on the intake underside needed rescribing. Fortunately, Tamiya's instructions to install the nose wheel leg at this point can be safely ignored. The entire trunking then needed to be fitted into the lower fuselage. 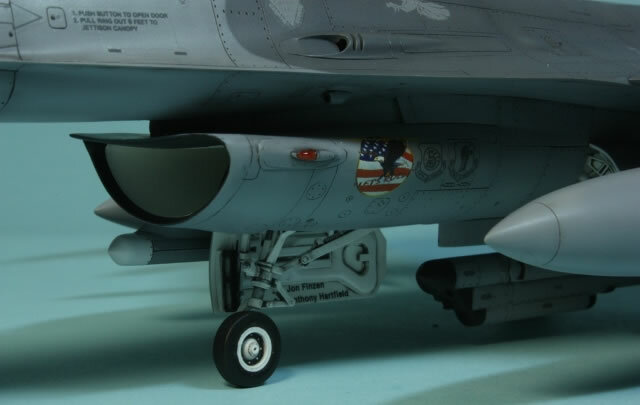 First I had to paint the outer intake in the camouflage colours, since the area between the fuselage and the intake is very difficult to access once installed. Once done, the whole assembly was slotted in and fitted rather nicely. The three main fuselage pieces and lower wings could then be joined, all without much fuss; the joint on the underside of the leading edge extension is rather messy and needed tidying up with superglue as a filler and rescribing. The basic fuselage was now complete and other assemblies could be added. The tail appears to be somewhat over-engineered, with metal rivets and an option to leave the entire unit removable. I glued eveything together, but had to do quite a lot of bending of the tab at the base of part F13 (the actual tail) to avoid a very significant lean. I've no idea what caused this, but I recommend you carefully check the alignment of all these pieces before committing the parts to glue. The nose cone was also a little problematic. The joint between the nose cone and the fuselage involves no less than seven parts coming together; it was never going to be great! In my case, the nose cone was slightly too large all the way round. At this point I was very frustrated, but with some patient sanding and rescribing the joint as I went along, I ended up with a very pleasing result. 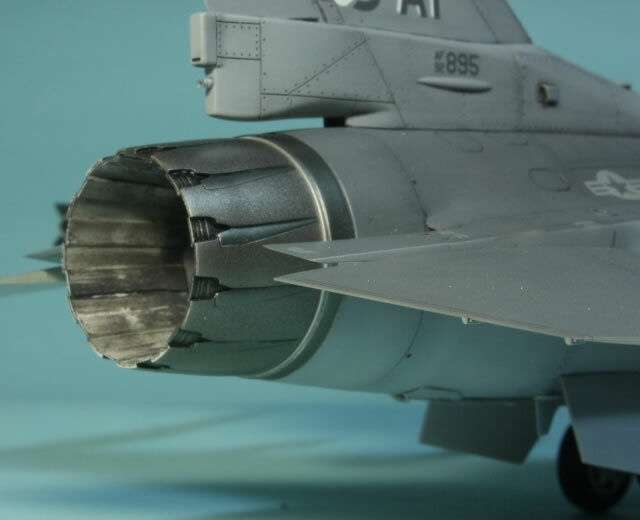 The tail cone, into which the exhaust can be fitted after painting, was also too large all the way round, but responded well to more patient sanding and rescribing. Numerous seperate panels and intakes are provided, and all fit satisfactorily. As an aside, unlike everyone else, I am not a fan on joints falling on panel lines, since a seam is much easier to simply eliminate than it is to make it look like a panel line, but I know I'm in a minority here. At this stage, almost all construction was done. 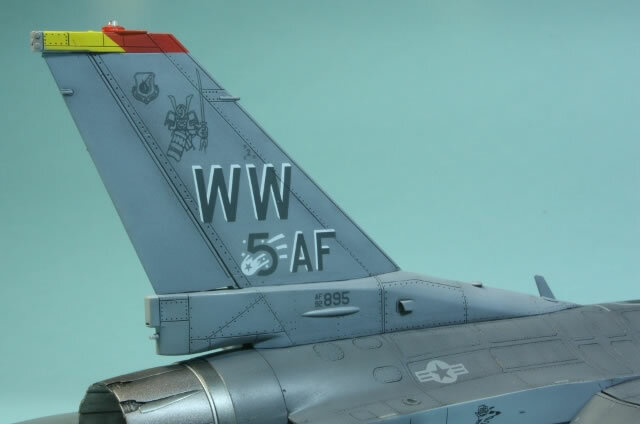 I left the tailplanes, flaps, and pylons off for painting. 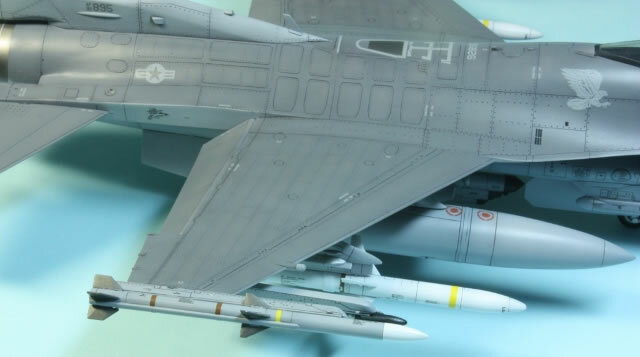 I also did not install the main undercarriage and left off the lower fuselage panels that straddle the undercarriage bay (parts F21 and F23). Dry-fitting showed that they should fit well, although I was nervous about doing so after painting. 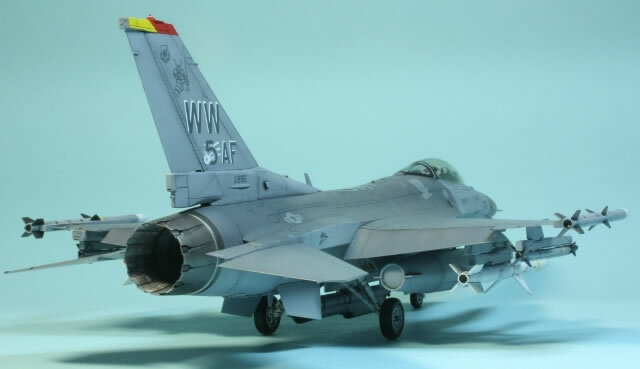 My final addition was to replace the nose pitot with brass wire and tube; I sacrificed accuracy for strength, since my version is rather simplified compared to the real thing. With the canopy fitted and faired in, it was time to move on to painting. 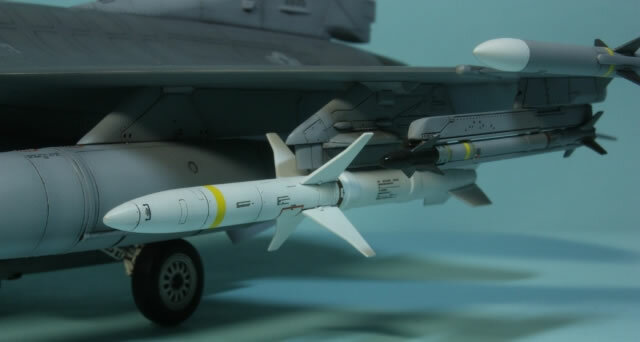 I am not a fan of adding ordnance to my builds, simply because I like the shape of a clean airframe and making missiles and bombs lengthens the build time. 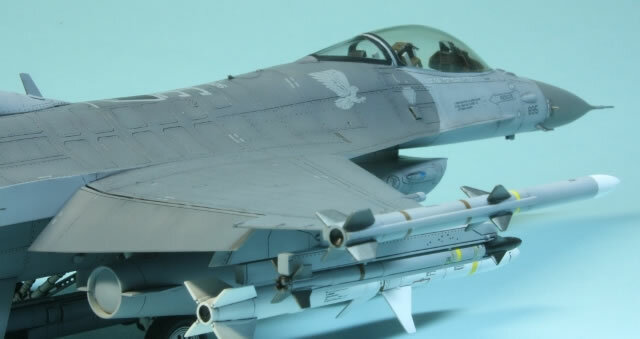 But in this case I could not resist adding the kit supplied missiles and tanks; the F-16 seems pretty small and I like the way it looks loaded up with the huge tanks. The ordnance in the box is painless to build and seems pretty well detailed. It was all painted using Gunze Mr Color laquer paints and stencilling is provided in the box. For a grey jet, the painting took a fair amount of planning. 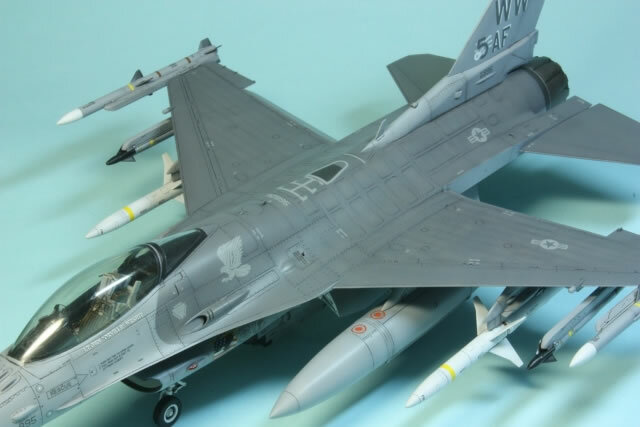 I did have a photo of the aircraft I was building, which confirmed that Tamiya have the paint scheme incorrect; it should be a two tone scheme with the lighter undersides actually in the same colour as the forward fuselage and tail unit (i.e. the two shades are FS36118 for the dark grey and FS36270 for the light grey). 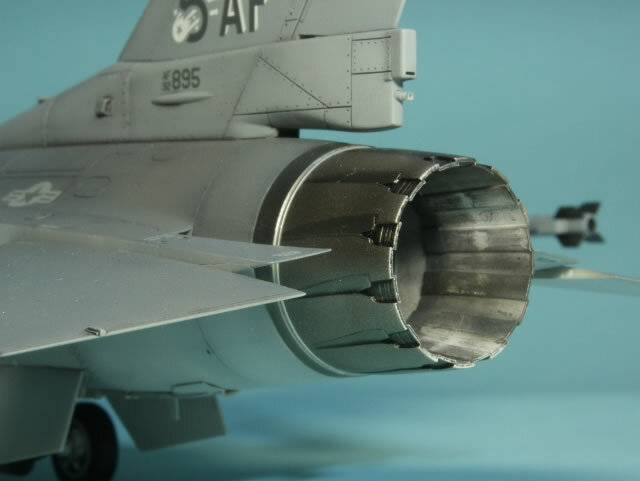 The nose cone is a warm grey, for which I used FS36231, which is a little dark but looks to have the right tone. First to go on was a primer coat of Mr Surfacer 1000, followed by preshading with black and white. 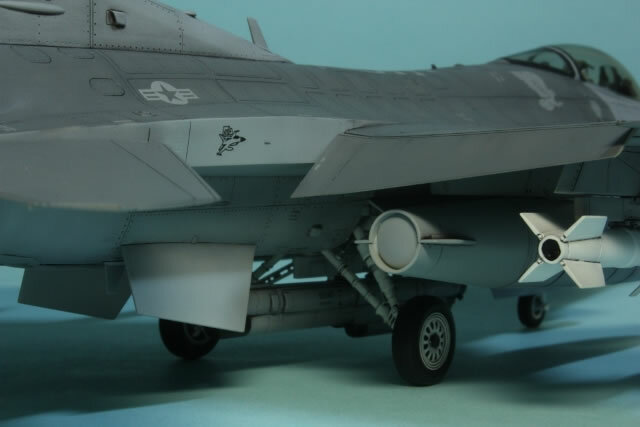 The black was also used for the canopy framing (which I ended up masking a little incorrectly around the main canopy) and the missile nose cones. 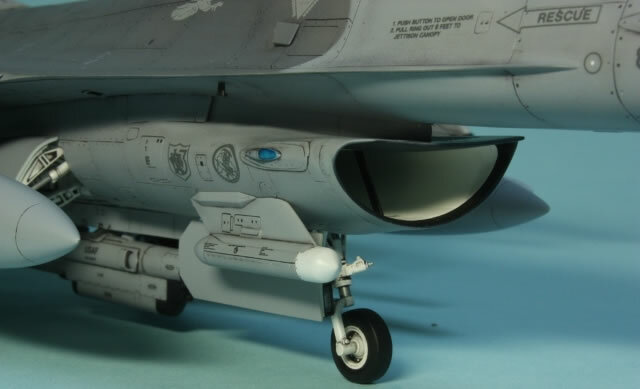 Mr Basic White 1000 was used for all the white areas (HARM bodies, AMRAAM and pod noses) as well as an undercoat for the tail tip, which was then airbrushed yellow and red; I really couldn't see the kit decals working there. More detail painting followed, with the nose in Mr Color 317 and the chaff dispensers and exhaust petals in 61 Burnt Iron. 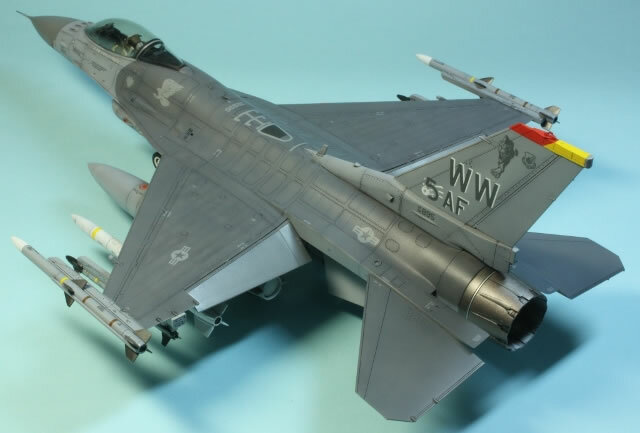 Alclad II Steel was used for some contrast on the exhaust petals, and for the exhaust ring, as well as the AIM-9X and AMRAAM missile fins, followed by Aluminium for the shiny metal exhaust ring and a couple of fuselage panels. 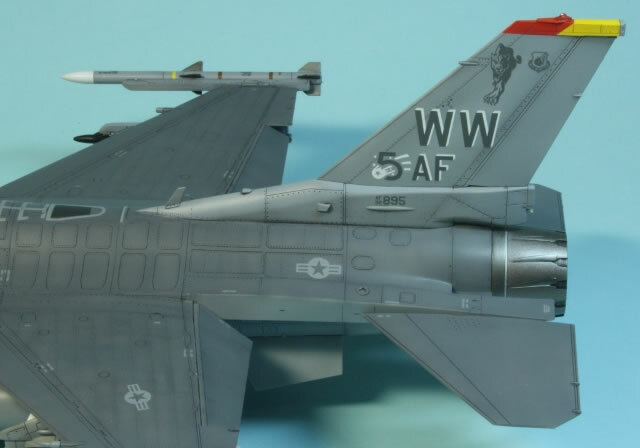 Lastly, the two greys were used to paint the fuselage, heavily thinned to preserve the shading and masked using blu-tac to get a tight but feathered demarcation. Although I really like using Mr Color paints, they continue to frustrate me. 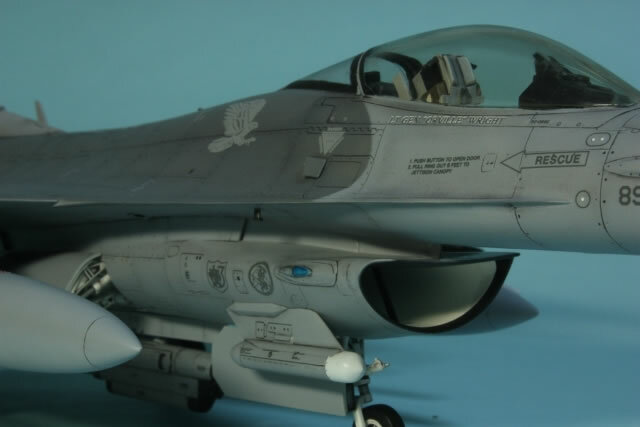 Despite cleaning the model in soapy water before priming and only handling whilst wearing gloves, small patches of the paint were pulled up by Tamiya masking tape. I often read of how durable Mr Color paints are, but I actually find them rather fragile and susceptible to being pulled up by masking and to being scratched. Once painted, a coat of Johnson's Klear was airbrushed on. I was so pleased with the shading at this point I seriously debated whether I wanted to use an oil wash or not. I love applying washes &mdash; I think they are quite integral to my modelling style &mdash; so I couldn't resist, and added a dark grey oil wash thinned with Zippo lighter fluid. Usually I would leave it here, but I am using <B>Gunze</B> decal setting solutions and I have found that sometimes they react with the Klear. 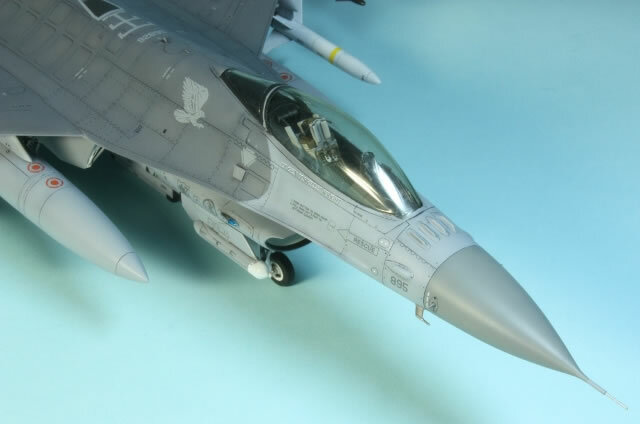 This time I figured I should use Mr Color clear lacquer to seal the model before decalling, since I reasoned that this Gunze product would be unlikely to react with decal solutions from the same brand. This proved right, and in future I will use this to seal in the wash and prepare the model for decalling. The only downside is that the more paint there is on the model, the more chance for bits of dust and rubbish as well! I used the kit decals, since I liked the scheme and couldn't afford aftermarket, and found them adequate. They are nicely printed, although thick. I tried a different method using Mr Mark Setter, not squeezing out any excess, but just letting the decal dry in a puddle of the setting solution. I'd had great success with this method on my Eduard Mirage IIICJ, but it didn't work here, leaving lots of air bubbles. Halfway through the process I switched back to my old method of leaving the decal in a puddle of Mr Setter for a while, then squeezing out the excess using a cotton bud and finishing off with Mr Softer. On those decals that silvered I used a pin to make lots of tiny holes in the silvered area and then about 15 different applications of Mr Softer; eventually I got rid of most of it. With the decals on, final assembly commenced. The undercarriage was added -- the fit being so precise that some of the actuators are not glued in -- and the final underfuselage panels installed. The fit was not great, and there is a bit of a step at the front of the bay, although the centreline pylon does a good job of covering it up. Everything else fitted perfectly, although the main undercarriage doors were a little challenge as one of the actuator rods had got a little bent. With everything on, I used a flat/satin coat made of Polly Scale Satin and Xtracrylix Flat, which gave the sheen I was looking for. The last step was to remove the masking and touch in the red and green navigation lights. Unfortunately I realised at this point that the little tube on the fin leading edge had broken off. 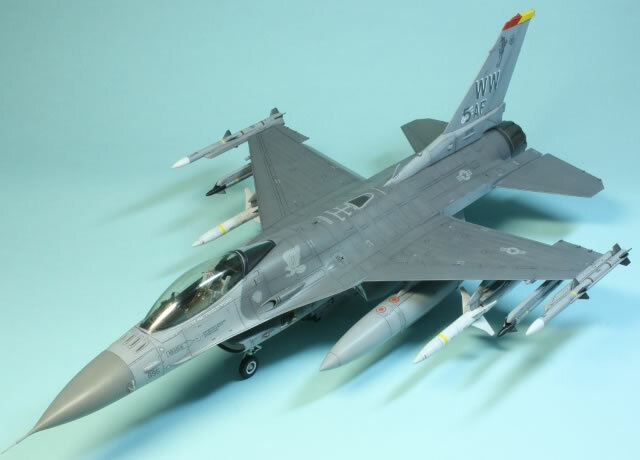 This always happens to me with F-16 kits, and I was very frustrated to have damaged it so late in the build. Scratch building a new one is beyond me, and I live in hope that one day the broken off section will reappear in a corner of my work table. This was a great build I thoroughly enjoyed. The kit is not perfect; the fit leaves something to be desired in some places and the ejection pin marks are a real pain. But the engineering is something to marvel at, and consensus seems to be that it is a very accurate kit. 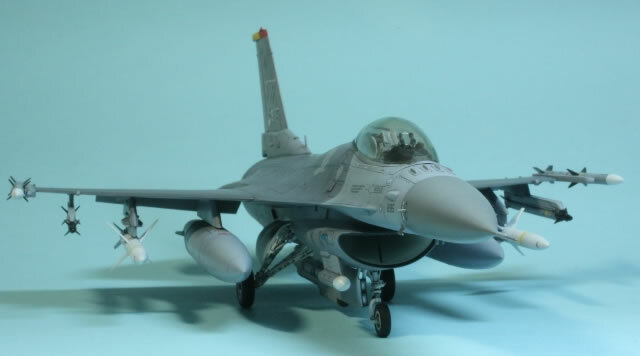 I sincerely hope Tamiya gets round to making an F-16B some day!